Enjoy this twisted breakfast favorite in a bowl of milk! 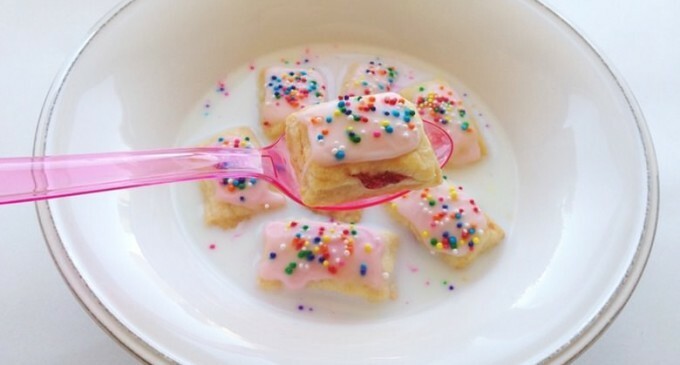 Have you ever tried Pop Tart Cereal? Now you don't have to choose which sugary treat you want for breakfast! There are tons of breakfast cereals on the market and few of them compare to the delicious flavor of a regular old Pop Tart. I was begging and searching for a recipe like this and after hours of frustration of scowering the Internet I made my own, which turned out to be the best idea ever. This recipe can be adapted in so many ways: If you hate strawberries then use Nutella, if you hate Nutella use Almond Butter.. No matter how you make your Pop Tart you can change it up in just minutes. I feel like I mastered something incredible here. Pop Tarts are expensive.. so is cereal. After I hacked the secret of making Pop Tarts I made the implosive decision to cut those little puppies up and throw them into a bowl of milk. I’ll make this been lookin for something for breakfast I would eat that would help me gain weight fast!!! !